MEET: Saturday, April 13. Cars leave at 12:15 p.m..
RETURN: Sunday, April 14, 2013 2 p.m. MEALS: Patrols have made their meal plans. If you said you were coming, and find you can’t make it, let your patrol know so they can make sure the food is covered. GEAR: Overnight camping gear and the food supplies you were assigned. 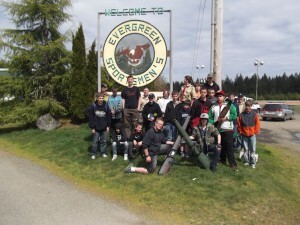 Our Shooting Sports Weekend is scheduled for April 13-14, 2012. We will depart the old Fire Station at noon on Saturday, April 13th. We should return back to the Fire Station at 2 p.m. on Sunday, April 14th. If you plan on Trap Shooting (Shotgun) the cost is $5.00 per person. This will cover the shells and range fees. The Troop will pay for .22 shells and camping.